It's day 1 of My Creative Time's 58th Edition Sneak Peeks! We've got a very fun release to share with you this week! Get ready to celebrate all of the goodness of fall! To start off our sneaks, we've got a darling stamp and die set called Candy Corn Kisses. It includes two different candy corn stamps with coordinating dies and four fun sentiments! 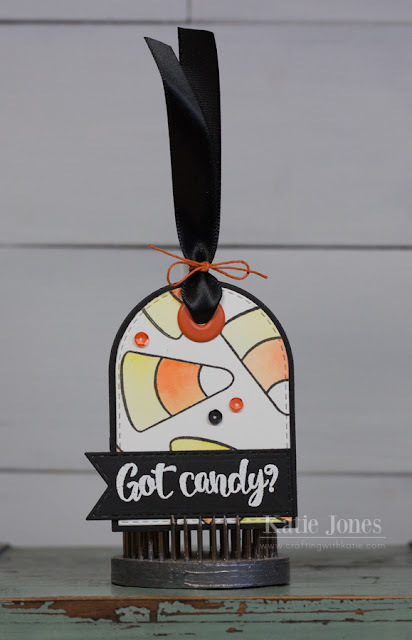 I thought it would be fun to make a cute tag using this set that I will be able to tie onto a bag of candy corn to give to a friend when we get closer to Halloween. I used the Just Tags dies, cutting the layer out of Strathmore Bristol cardstock, and stamping the smaller of the candy corn images all over it with Verafine Black Onyx ink. I then colored them with Zig Clean Color Real Brush Pens. My little sentiment banner was made with one of the Sentiment Label Dies, and I trimmed off one end. I stamped the sentiment, from Candy Corn Kisses, with Versamark Ink and heat embossed it with white embossing powder. OMG Miss Katie Your Tag is Absolutely Adorable...Love creative way you stamped the candy corn and you so did a fab coloring job..they look so real....great ideas for all your layering...Your friend is so going to love her tag....You definitely did a Super Outstanding Creative job!! Hello Miss Katie, I'll love your Candy Corn Tag!! Thank you for sharing this idea!! Awesome candy corn tag, perfect for a treat bag. Such a super cute tag! Just perfect size to put on a sweet Halloween treat! Thank you for sharing! Have a great week! Ms. Katie, how cute! I love tags and I love the embossing, great job. Cute tag! This looks like a fun stamp and die set. Your tag is so cool!! Love the idea .... great ideas for my kids Halloween Party!! I love the tag you created!! So adorable! Sweet tag! This would be great on a bag of candy corn! Great job on the coloring too. Very cute candy corn tag! What a super sweet tag, Katie! So cute!!! Darling tag! Love the orange, black and white combo and the cute candy corn designs! So fun! This is such a sweet tag! Love the sentiment too! Your tag's a little 'corny' Sorry, that was an awful pun! Seriously cute tag! Such a sweet tag Katie! Love this time of year and what a GREAT way to start off release week...with a super ADORABLE candy corn tag! Your candy corn tag is adorable! What a FUN set!